Back with another Famous Fridays for you and this time we’re taking a little trip to Nashville via Carla Hall and her wonderful cookbook Soul Food: Everyday and Celebration and these amazing Sorghum Drop Biscuits. Pack your bags! Believe me, you’re going to want to come along for the trip! You know Carla, right? She’s the Food Network and The Chew star who infuses her distinctive, zany and energetic personality and heritage into everything she cooks and does. I’ve already featured her on FF once before with this out-of-this-world yummy, Butternut Squash Tarte Tatin from one of her earlier cookbooks and today I’m so excited to tell you all about this latest book. In it, Carla goes back to her Nashville roots and not only shares favorite family recipes and stories but explains how southern comfort food evolved out of African and Caribbean traditions. Carla’s a vegetarian so there are a good amount of southern-style vegetarian recipes like Chunky Tomato Soup with Roasted Okra Rounds, Peach and Tomato Salad, Sweet Potato Pudding with Clementines, Pigeon Peas and Red Rice as well as meat, poultry and dessert offerings like Ghanian Peanut Beef and Tomato Stew, Molasses Baked Chicken Wings, Poured Caramel Cake and so much more. And all of the recipes are explained in an easy to understand, unfussy style. I’m loving cooking my way through the book—everything I’ve already made has been terrific and I’ll be sharing many of them soon but today it is all about biscuits because A) I was intrigued by sorghum flour, as I’ve never cooked with it before, B) I adore biscuits in all shapes and forms and C) what’s more southern than biscuits?!! First, let’s talk about sorghum. What is it? If you’re like me, you didn’t know that it is a cereal grain that’s very popular around the world, especially in Africa and is naturally gluten-free. When it’s turned into flour, it has a sweet, almost malt-like flavor and when it’s added to regular all-purpose flour, it helps it become more like the White Lily flour that is so ubiquitous to the South and which gives their baked goods that distinctive light taste and texture. I didn’t have any problem finding it in the market—Bob’s Red Mill makes it, but if you do, you can always order it online. And it’s so worth it because I have a feeling you’re going to want to make these biscuits a regular thing. That’s because in addition to being delightfully delicious, they are also super-duper easy. No rolling out, or folding the dough. Carla even encourages you to use your hands to sift and mix the dough like her grandma did—the old fashioned way. I think that’s because grandmas knew that a light touch with biscuits is what keeps them from being dense and tough. You should be able to see little pieces of butter that don’t get entirely incorporated into the dough and the whole thing should look sort of shaggy. And once you’ve mixed the dough, you simply scoop out mounds and place them in the skillet. Twenty minutes later, you’ve got yourself a pan of golden brown perfection! Or with a pat of butter. 1. Preheat oven to 450ºF. Butter a large cast-iron skillet. If you don’t have one, you could also use a large round cake pan. Set aside. 2. Put both flours, baking powder, sugar, salt and baking soda in a large bowl and use your open hand to mix them together, using your fingers as a whisk. Add in the shortening and use your fingertips to pinch it completely into the mixture until you get coarse crumbs. 3. Now use a box grater to grate the frozen butter on the large holes, into the flour mixture. Toss so that all the pieces are coated with the flour. Add the buttermilk and use your hand as a spatula to gently mix the dough together until a shaggy mass forms. Scrape the dough off your hand. 4. Use a large spoon to drop 16 equalish sized mounds of the dough into the prepared skillet, spacing them about an inch apart. Bake for 20 minutes, until golden brown. Let cool a bit and then serve. These are great as is or with butter and honey or jam. 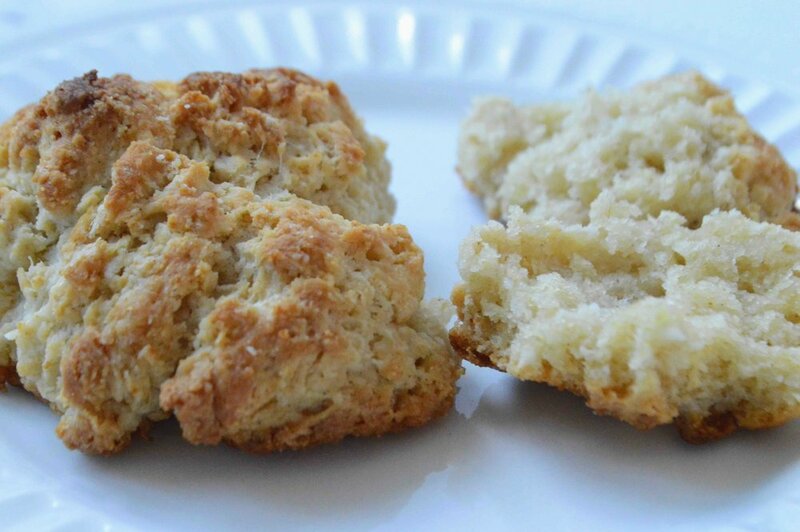 Like all biscuits, they are best on the day they are baked, but also delicious reheated for several days afterwards. Store in an airtight container in the fridge. Note: Recipe adapted from Carla Hall’s Soul Food.